A capacity crowd attended the Oct. 13 fundraising gala hosted by Ekal Vidyalaya, the leading non-profit that supports wholistic development initiatives in some 77,000 remote villages in India. 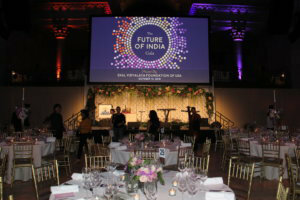 A record $3 million was raised according to organizers, at the “Ekal Vidyala Future of India” event held in Cipriani Wall Street in New York City, where some 400 people came and generous opened their wallets to give. Two recent Ekal galas in Houston (Oct. 6), and Washington, D.C. (Oct. 12), also raised impressive amounts of $1.5 million and $1.1 million respectively. Keynote speakers, John Sculley, former CEO of Apple and Pepsi; and motivational speaker and Indian actor Padmabhushan and Padmashri awardee Anupam Kher presented keynote speeches. 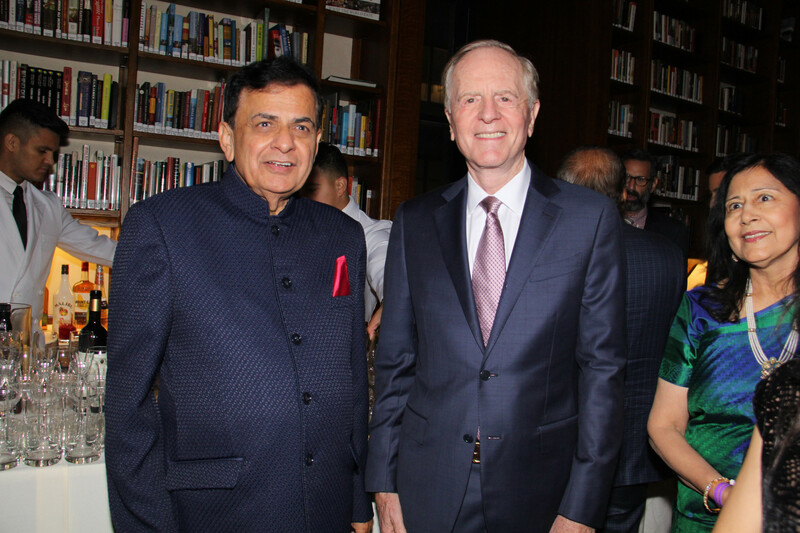 Among other notable guests were India’s Consul General in New York Sandeep Chakravorty, Desi Talk publisher Padma Shri Dr. Sudhir Parikh and Dr. Sudha Parikh. 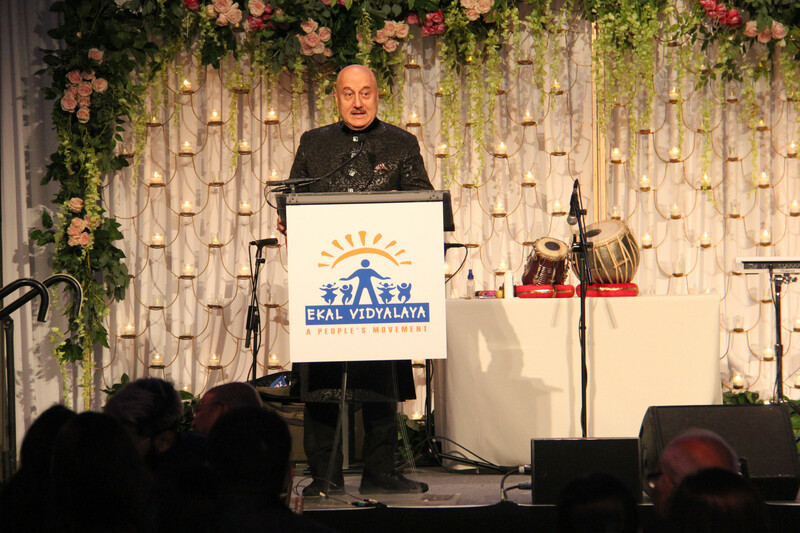 “Raising 3 million dollars is indeed very commendable and I look forward to seeing the lives of the Ekal villagers being transformed with the resources provided” said Anupam Kher at the event. 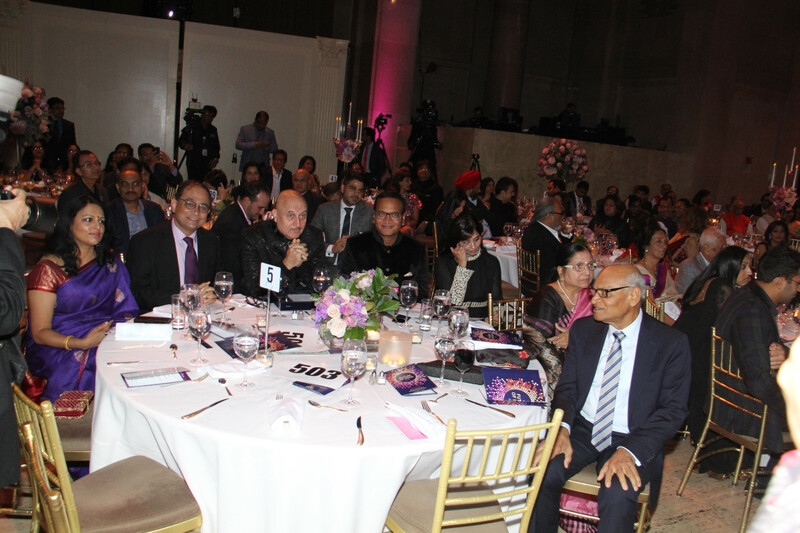 Consul General Sandeep Chakravorty with Anupam Kher and others in the audience. Consul General Chakravorty, who was a distinguished guest at the event, said, “EKAL – represents ‘Education Knowledge and Learning’,” and made the case for supporting this initiative. Prakash Waghmare, media affairs chairperson, recalled to Desi Talk in a shared email, the long association Drs. Sudhir and Sudha Parikh have with Ekal. “In fact, an initial strategic meeting with Dr. B.K. Modi, Dr Mahesh Mehta, (founder Shyamji Gupta too – if I am not mistaken) and me took place (20 yrs back) at Dr Sudhir Parikh’s place,” Waghmare said. Following a brief introduction by Suresh Iyer, president of Ekal USA, Mohan Wanchoo, founder and CEO of EC-Infosystems, chairman of the gala, gave a summing up of Ekal’s mission. Chirag Patel, founder and CEO of Amneal Pharmaceuticals who served as the co-chair for the gala, spoke of the importance of supporting Ekal for the sake of India. Ranjani Saigal, executive director of Ekal, presented an overview of the Ekal programs that includes the three verticals of education, health and skill training. She shared a few success stories. 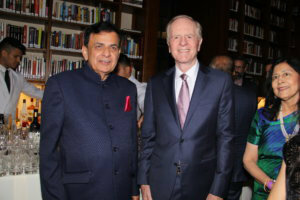 Padma Shri Dr. Sudhir Parikh and Dr. Sudha Parikh with John Sculley. “Chandini , a young woman who comes from a village in Bihar where no girl ever had an education is now doing her undergraduate degree and is serving as a teacher in an Ekal school,” Saigal said. “Pinky from Assam, born to an illiterate mother carried the torch for India at the London Olympics and is now working for UNICEF. Kalpana, an Ekal alum from Jharkhand is studying to be an electrical engineer,” Saigal added. Sculley spoke about the value of education and the importance of supporting Ekal.”It is indeed amazing how little resources are needed to make a difference” said Sculley. Kher shared his personal story and emphasized that even with just a little support, dreams of the underprivileged can be transformed into possibilities for young children to grow up to be successful. A pledge drive was the highlight and focused on supporting a variety of projects in the area of education, health and skill development. “Philanthropists opened their hearts and wallets and donated generously,” organizers said in a press release. Inspired by a matching donation from Sarva Mangal Family Trust to bring tablets to Ekal schools, $150,000 was raised, which with the match becomes $300,000. That amount would make it possible to equip 600 schools in India with the tablets for students. Anupam Kher speaks at the gala. The highest bid for the evening, a half million dollars, came from an anonymous donor who wanted to support the expansion of the schools to reach the target of 100,000. The donation would help support 1,500 schools. Chintu Patel, co-founder and CEO of Amneal Pharmaceuticals made a passionate appeal for supporting the eye initiative at Ekal which he personally promised to support in partnership with Irada, a foundation started by Falguni and Chintu Patel. The evening came to a close with a musical program by Bisakh Jyoti which brought attendees to the dance floor.